Cervical spondylosis (arthritis of the neck) is a degenerative condition that develops as we age and affects the vertebral disc and facet joints. Over time, many people experience degenerative changes of the spine, such as this common type of arthritis. 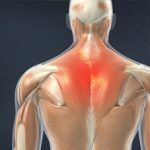 In fact, spondylosis is the most widely seen type of osteoarthritis of the neck, affecting more than 85 percent of the 60+ population in the United States. Neck pain can occur for many different reasons, including wear and tear, trauma, and injury. In the case of spondylosis, the main culprit is simple: age. 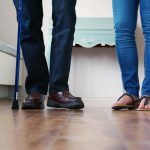 Since the majority of older Americans experience this type of osteoarthritis, today we are going to take a closer look at the common causes and treatments of spondylosis. The human body is a complex network of muscles, tissue, ligaments, bones, cells, and more. As we get older, it is natural for these parts to degenerate. This is exactly what happens when spondylosis is present. The discs and joints located within the neck (cervical spine) succumb to age, resulting in a wide range of unpleasant symptoms. However, in many cases people do not realize they have spondylosis because their symptoms are so mild. This can make the common type of osteoarthritis difficult to diagnose.  If you are experiencing any of the above, we encourage you to schedule an appointment with Dr. Atwater. Through a physical examination and x-rays, an MRI or CT, or another test, we will be able to determine if you are suffering from spondylosis. Generally, surgery is not required when treating osteoarthritis of the spine. We will discuss some of the most effective ways to treat spondylosis a little later, but please do not hesitate to reach out if you have any questions. Thankfully, the majority of spondylosis cases are mild and carry minimal symptoms. This means that spondylosis often does not require treatment. These treatments are often ideal for people who are experience nerve pain or damage because of spondylosis. We would be happy to provide a recommendation for a good physical therapist or discuss the other treatment options with you, if you would like. The type of treatment that will work best for you will depend on a host of factors, including medical history, age, and the current state of your spine. 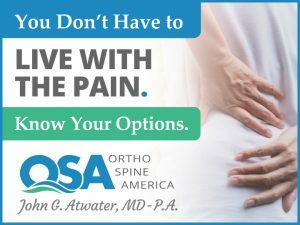 Please contact OSA to schedule an appointment with Dr. Atwater today to discuss any spondylosis concerns.